Looking for inspiration? Would you like to win a free book to help you get started on some art projects you've been putting off? 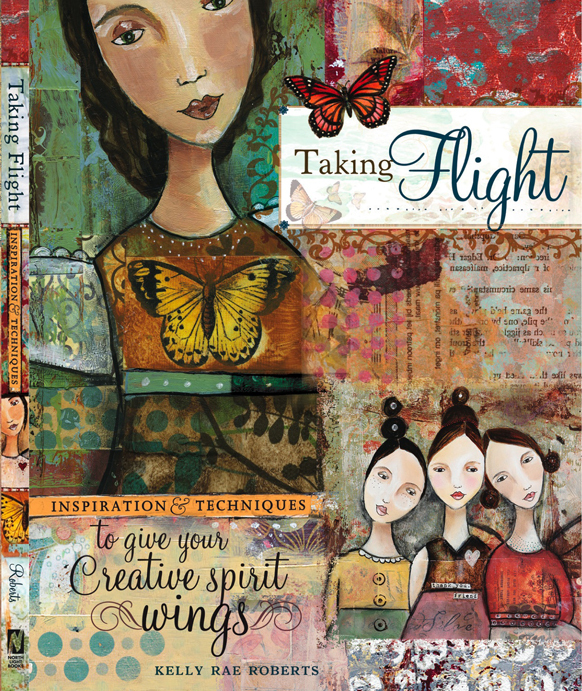 I'm so very pleased to talk about Kelly Rae Roberts today and the release of her new book Taking Flight: Inspiration And Techniques To Give Your Creative Spirit Wings as well as a mini contest in which you can win a free autographed copy along with one limited edition print! Before I tell you how to win, let's talk about Kelly's life and book for a moment shall we? I've decided to make it the decor8 book of the week since the theme of this book has already inspired me so much that I'm going to purchase a copy to rekindle my artistic side a little. With Fall on it's way, it's the perfect time to find some 'cozy' at home projects to work on and painting couldn't be more fun! Kelly is what you'd call a late bloomer. I don't mean this as an insult, but you know how it works. One is expected to go to college and settle on a career and go with that for as long as possible. There are bills to pay! Kids to feed! No time (or money) to change the tide and decide to take on a new career once you're neck deep in what's called "life". I personally find this general mindset (one that forces sticking to one profession for life) both frustrating and mundane. If a person genuinely wants to change their course, I say GO FOR IT. Whether you change your career or just add to your day job with an exciting evening pursuit, dream big and jump right in. My goodness, we only will be the age we are today for one year and then we move on to the next and the next and soon we're living with regrets (or let's hope not) that we didn't go for our dreams much sooner.? I'm especially fond of what society calls "late bloomers" like Kelly because I happen to be one myself, I didn't listen to my creative voice until I turned 30. 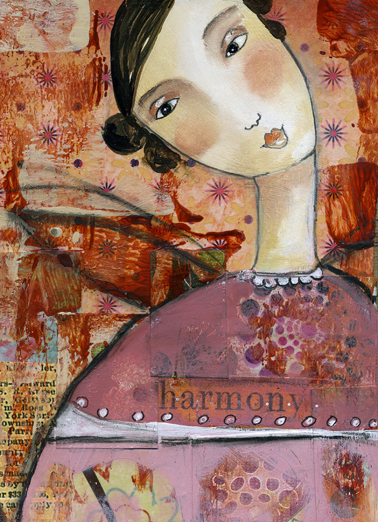 Kelly is a successful mixed-media artist who didn't listen and develop her creative side until she was 30 but once she did, she found nothing but success by listening to her inner longing. How about that? Maybe you can be another Kelly. Any why not? I believe that if you associate with successful people (whether online, through books, magazines, in person, whatever) you can become a success. That's why I think it's important to surround oneself with those who are reaching goals and fulfilling dreams like Kelly. We may never meet her in 'real' life, but we can meet her online, read her website and blog, and read her new book and there we can be around her and breath in her positivity. Perhaps this sounds corny or way too hyped-up but you know what? I believe it. To repeat what we've all heard a million times as children, "You are the company you keep". In addition to her new book, her work has been published both online and in magazines, she runs workshops, has a busy little Etsy store, she presents in juried art shows regularly, and her paintings are known, and collected, all over the world. The internet has given her business wings, as much of her networking takes place online and also during art shows, but through her etsy store, blog, website, and the supportive network of fellow artists online, her life has literally exploded into the things dreams are made of. Magic. Win this Limited Edition Print. That's not all... Kelly just received a long-term licensing agreement with a large publishing company so you can expect to see more of Kelly on greeting cards, magnets, calendar, wall art (reproductions), and journals throughout America. All I can say is YOU GO GIRLFRIEND (*snap*snap*snap*)! This is one inspiration story that deserves the spotlight. I think it's exciting to see her grow right before our eyes online, I remember first hearing about her a few years ago and now to see how far she's come further proves that with so many success stories out there, why not be one yourself if you heart happens to long for a walk down an alternate career path. Who knows what will await you if you follow your dreams. Would you like to know a little about Taking Flight? It's an art how-to book that demonstrates step-by-step instruction guiding you through creating your own mixed-media painting. Kelly, along with seven contributing artists show you the ropes offering a fresh new perspective to this medium. She also shares inspirational quotes, encouraging stories, and encouragement that may help you find, and follow, your bliss too. Of course no art book would interest any of us without images! Kelly features pages of her own work along with those from contributing artists so there is a nice range for your enjoyment and inspiration. Interested in winning a free, autographed copy of Taking Flight along with a free limited-edition print? Kelly has offered to give these things away to 3 lucky decor8 readers today. The contest will end on Friday at midnight EST and winners will be announced on Tuesday, September 9th. Kelly will sign and ship your prizes to you personally! To win... Please comment below telling Kelly and I about your dream job and whether or not you are currently pursuing it. If you are living your dream, comment with the best advice you can give others to encourage them to do the same. If you are not living the dream, comment on why you are not and by all means, go into as much detail as you'd like. Have you found balance between the day job and a fun evening or weekend pursuit? No answer is wrong as they will be selected at random according to comment number. The goal here is to encourage yourself while encouraging others and hey, you just may win some free goodies so why not!? 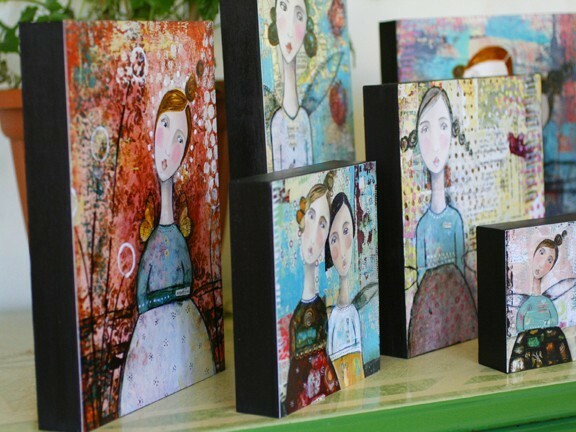 The Enormous Tiny Art Show - Now Online!